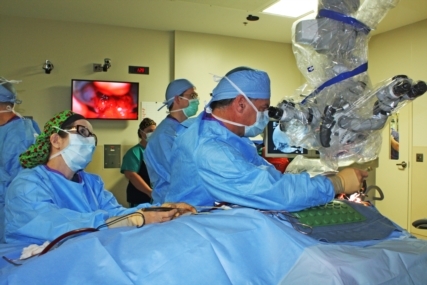 In delicate brain surgery, surgeons rely on advanced magnification and visual clarity to enhance their skill. In 2011, we acquired the Zeiss OPMI Pentero neurosurgical microscope, which provides surgeons with clearer and more powerful magnification, as well as inter-operative diagnostics and support of fluorescence-based procedures such as tumor removal and resections. With these capabilities, neurosurgeons can easily distinguish between the cancerous tumor and healthy tissue.